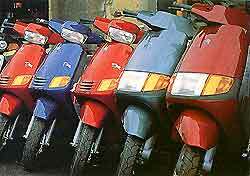 Milan is a relatively easy city to get around. The centre is fairly compact and most of the sights are within walking distance of one another. Although there are some traffic-free areas, such as Brera and the historic centre, much of Milan is not well pedestrianised. There is an excellent bus network and local railway. Alternatively, if you prefer to be driven around there are plenty of taxis, although these can prove an expensive way to travel. 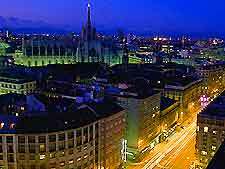 Milan is served by two of Italy's busiest airports, Milan Malpensa Airport (MXP) and also Linate Airport (LIN), both handling a large number of international and domestic flights. Traffic in Milan is often heavy and driving in the city centre can be quite an experience, as Italian's tend to drive fast and can be somewhat impatient. Parking in the centre can also prove difficult. Although the city can become rather chaotic at peak times, a car provides a very convenient way to travel outside of the city centre. In Italy, people drive on the right-hand side of the road and overtake on the left. Many car rental agencies are available and there is a particularly good selection of these at the Milan airports. Book your Milan MXP Car Rental here. Book your Milan LIN Car Rental here. Official Milan taxis are generally white, although there are also some yellow and other colour taxis. Taxis in Milan are one of the most popular means of transport in the city, especially for business purposes. They can normally be found lined up at stands and can also be called by phone. There may be some supplements, such as luggage or late night charges, that do not appear on the meter and so it may be useful to ask about these before leaving. You should only use the official licensed taxis, which are clearly identified by the taxi sign on the roof and a numbered shield on the side. There are currently three subway lines on the Metro system, numbered 1, 2 and 3. The Metro underground trains provide the easiest, cheapest and quickest way to travel around the city. Entrances to the subway are marked with a large white 'M' on a red background and are usually located close to tram and bus stops. The Metro opens at about 06:00 and the last trains leave at 00:30 on Saturdays. Stamped tickets can also be used for other means of public transport. 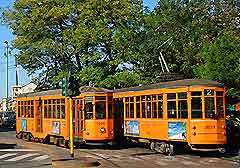 Milan's buses and trams are all orange, with the exception of the tourist trams, which are mainly green. They are often very busy and can become quite crowded during the rush hour. Serving the whole city of Milan, the tram and bus stops are easy to recognize and can often be found on islands, with seats where passengers can wait. The signs are yellow and display a route planner and timetable, but be careful to distinguish the summer (estate) from the winter (inverno) schedules, which are usually posted next to each other. Tickets should be purchased before you get on the bus or trams and they are sold at tobacconists, newsstands, some coffee shops and ticket machines and booths in Metro stations and at some bus stops. Travelling by bus in Milan may not be as fast as on the Metro subway, but it is certainly more scenic. 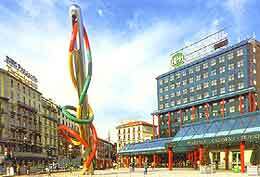 Milan has an overground railway network which is a useful way to travel if you are heading out of the city. This train service links the north-west of Milan to the metro and the line goes from Porta Venezia to Bosvia, with stops at Piazza della Repubblica, Stazione Garibaldi and Via Lancetti. Tickets must be purchased in advance and as with bus and trams tickets, can be bought at a variety of outlets and can also be used on the metro system. They remain valid for 75 minutes on all lines, although cannot be used twice on the metro. Tourist tickets offer particularly good value, with daily and weekly passes being available. Scooters are an excellent way to travel around the city and many locals use them to quickly reach their destinations, avoiding the long queues and traffic jams. There are several rental agencies in the city and riders are required to wear helmets by law. Cycling around the city of Milan can be a pleasant way to travel - when the traffic is light. The traffic in the city centre is often heavy and congested and so cycling in this area is only for the more confident cyclists. The tram tracks can also prove troublesome for cyclists in Milan. There are many bicycle rental shops in and around the city centre.